I don’t teach a research methods course and the quantitative approach is not emphasized by my department, so the subject gets sprinkled in bits and pieces across several of the courses I do teach. My typical introduction of methods in comparative politics used to be a lecture in which I defined cross-country comparisons and case studies, and gave an example of each. It was boring for students and boring for me. 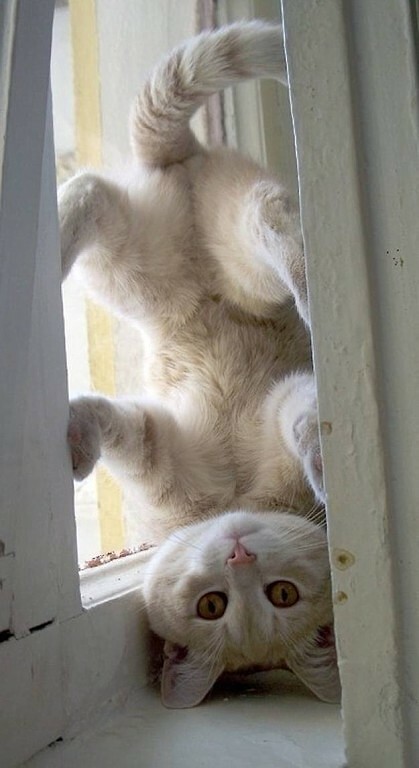 Now I flip this topic on its head. Here’s an example from last Tuesday’s class. The class discussed possible reasons, which I wrote on the board. Students eventually agreed that even though many nation-states have the economic resources needed to mitigate climate change, many governments lack the political will to implement policies that would cause this to happen. I then asked “Why do the governments of some nation-states refuse to implement policies that will reduce the effects of climate change?” After more discussion, students said that policymakers in those governments could be influenced by corporate interests focused on short-term profits. I then grandly announced to the class that they had formed a testable hypothesis, and asked “What can we look at in different parts of the world to measure the influence of corporate interests on policymakers?” Again some discussion, and students decided that they would operationalize the variable by looking at the amount of money spent by political lobbying firms. At this point I asked students what nation-states should be studied to test the hypothesis. “How about the USA? Lots of data, easy to collect.” Students said more cases were needed because the USA might be unrepresentative, so I asked for more countries. I then led the class through a brief conversation about sampling bias. I concluded this discussion by pointing out that they had identified the pros and cons of the cross-country comparison and the case study, the two major research designs in comparative politics, without me having to tell them first. An analysis of Samuel Popkin’s and James Scott’s explanations of rural revolutions, authored by yours truly. Theda Skocpol, “France, Russia, China: A Structural Analysis of Social Revolutions,” Comparative Studies in Society and History 18(2) (April 1976). John Pollock, “Streetbook: How Egyptian and Tunisian Youth Hacked the Arab Spring,” Technology Review, 23 August 2011. Do Scott, Popkin, or Skocpol explain the Arab Spring uprisings in Tunisia and Egypt? Why? 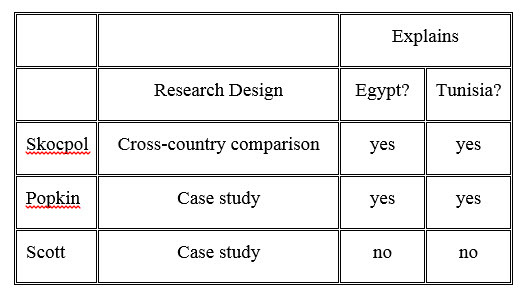 This exercise had the additional benefit of showing students that the utility of a research design can vary according to the phenomenon being investigated, and that people frequently arrive at different conclusions despite using the same design and the same cases.